LOCATION.--Lat 43°36'37", long 75°06'38" referenced to North American Datum of 1983, Herkimer County, NY, Hydrologic Unit 04150101, on left bank 0.5 mi west of McKeever, and 1.9 mi downstream from confluence of South and Middle Branches. PERIOD OF RECORD.--Continuous record--June 1900 to September 1970, occasional discharge measurements, water years 1971, 1977, annual maximum only--1987 to current year. October 2017 to current year (gage heights only). Monthly discharge only for some periods, published in WSP 1307. Prior to Oct. 1, 1922, published as "at Moose River". REVISIONS HISTORY.--WSP 624: 1922(M). WSP 729: Drainage area. WSP 874: 1928. GAGE.--Water-stage recorder and crest-stage gage. 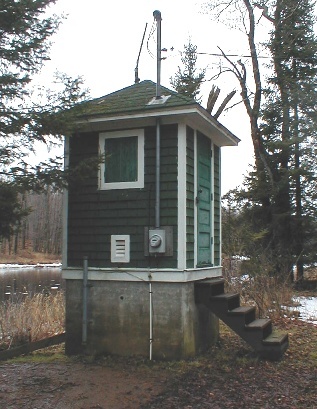 Datum of gage is 1,479.92 ft above NGVD of 1929 and 1,479.71 ft above NAVD of 1988 (VERTCON). Prior to Oct. 1, 1922, at site 2.5 mi downstream at various datums. Oct. 1 to Nov. 2, 1922, at present site at datum 1 ft higher. REMARKS.--Flow regulated to some extent by Fulton Chain of Lakes since about 1880. EXTREMES FOR PERIOD OF RECORD.--Maximum discharge, 18,700 ft³/s, June, 3, 1947, result of dam failure, gage height, 17.45 ft, from floodmark. EXTREMES OUTSIDE PERIOD OF RECORD.--Flood of Dec. 29, 1984, reached a stage of 16.0 ft, from floodmarks, discharge, 15,800 ft³/s.